This is the fourth part in a series of blog posts. The previous post was part 3: preliminaries. The next post is glitched Amiga video. In 2015 Game 2.0, a Retro Gaming exhibition visited the Centre for Life in Newcastle. On display were a range of vintage home computers and consoles, rigged up so you could play them. There was a huge range of machines, including some Arcade units and various (relatively) modern VR systems that were drawing big crowds but something else caught my attention: a modest little Amiga A500, running the classic puzzle game, "Lemmings". 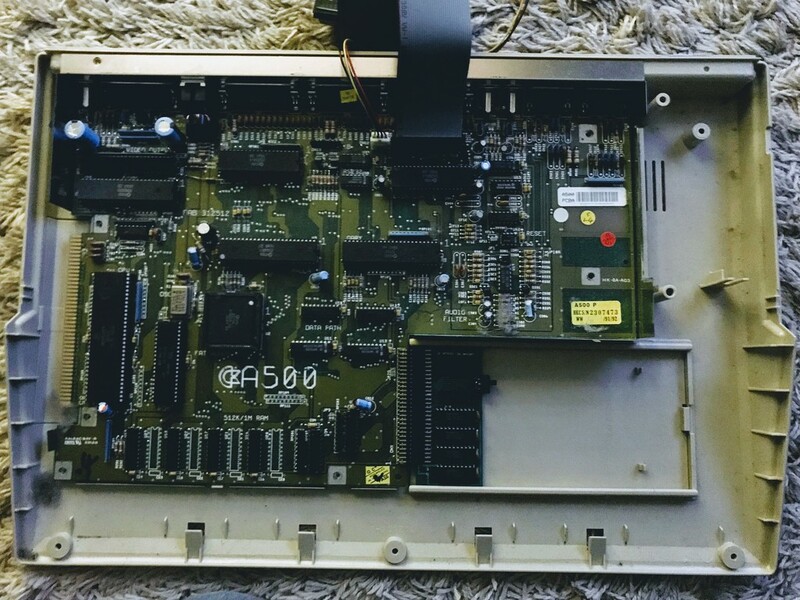 A couple of weeks ago I managed to disassemble my Amiga and remove the broken floppy disk drive. The machine was pretty clean under the hood, considering its age. I fed new, longer power and data ribbon cables out of the floppy slot in the case (in order to attach the Gotek Floppy Emulator externally) and re-assembled it. I then iterated a bit with setting up disk images and configuring the firmware on the Gotek. It was supplied with FlashFloppy, a versatile and open source firmware that can operate in a number of different modes and read disk images in a variety of formats. I had some Amiga images in "IPF" format, others in "ADF" and also some packages with "RP9" suffixes. After a bit of reading around, I realised the "IPF" ones weren't going to work, the "RP9" ones were basically ZIP archives of other disk images and metadata, and the "ADF" format was supported. 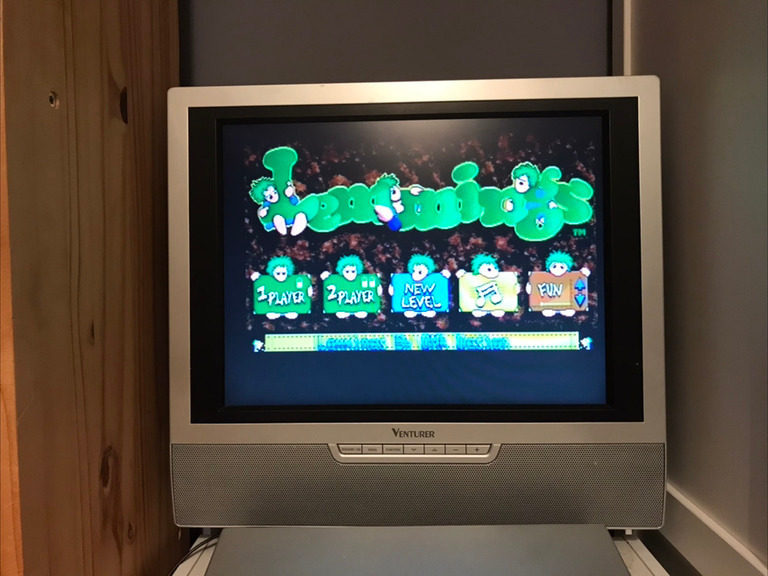 For my first boot test of the Gotek adaptor, the disk image really had to be Lemmings. Success! 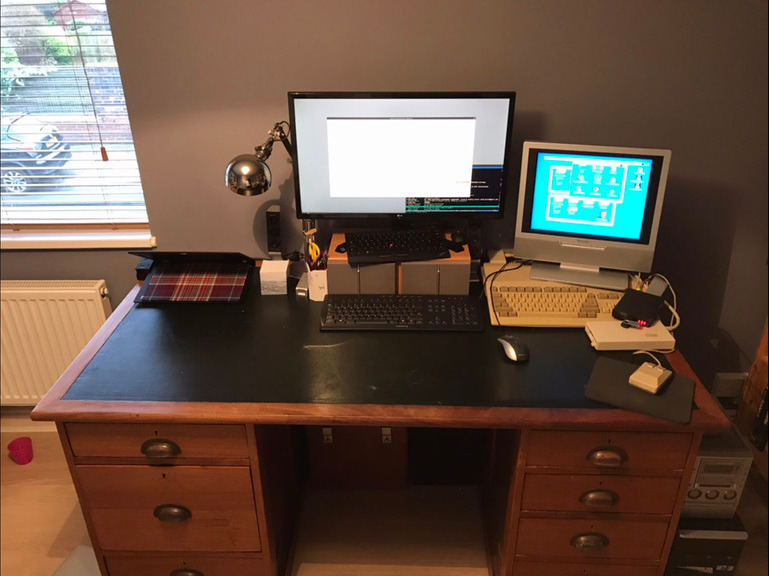 Now that I knew the hardware worked, I spent some time re-arranging my desk at home, to try and squeeze the Amiga, its peripherals and the small LCD monitor alongside the equipment I use for my daily work. It was a struggle but they just about fit. The Amiga 500 had an external harddisk, which happened to be a 20MB SCSI 1. Get yourself one of those (and a 4 GB SCSI disk) and you're set ;).